SSL - secure online shopping! 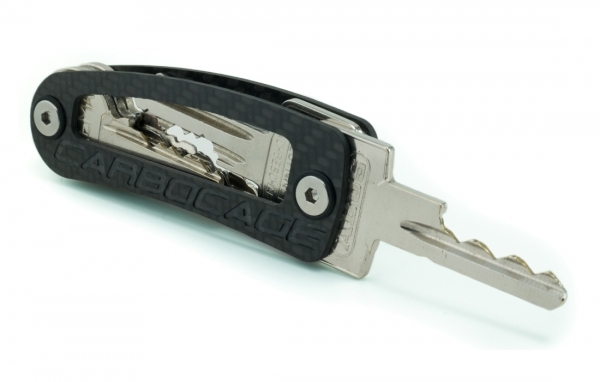 The KEYCAGE is the carbon key organizer that is more compact and stylish than a bunch of keys! Clutter and holes in your pockets are a thing of the past with the KEYCAGE; your keys are stored neatly and clean with the space saving design. The KEYCAGE comes in a double asymmetric design which means you can find your most important keys without looking. When you grab your KEYCAGE you will find the key you want straight away, great in the dark and when carrying other things. The force to swing out the keys is individually adjustable by the torque of the bolts. Buy a Bundle for You and Your Friends - up to 30% Discount! KEYCAGE - Bundle - up to 30% Discount! Subscribe to the free CARBOCAGE newsletter and ensure that you will no longer miss any of our offers or news. You have the possibility to unsubscribe at any time. Copyright © CARBOCAGE - All rights reserved.